I came across this quote from author L.R. Knost not long ago and it has become my mantra for calming meltdowns, tantrums and anything in between. Tantrums are a completely normal part of child development. It’s how our little ones express themselves over anything from discomfort to simply not getting what they want. But that doesn’t mean it’s not exhausting, frustrating and down right chaotic to try and diffuse them. Sometimes the response that our children need the most is the hardest to offer in the moment. In my experience, the most effective method for disarming a tantrum is a calming, positive approach. Here are 5 Simple Tips for Taming Tantrums that may help to deescalate meltdowns and preserve your sanity. It is entirely true that children feed off of our emotions. If we treat a child’s tantrum with fierce anger and frustration it is possible to intensify the tantrum rather than mitigate it. 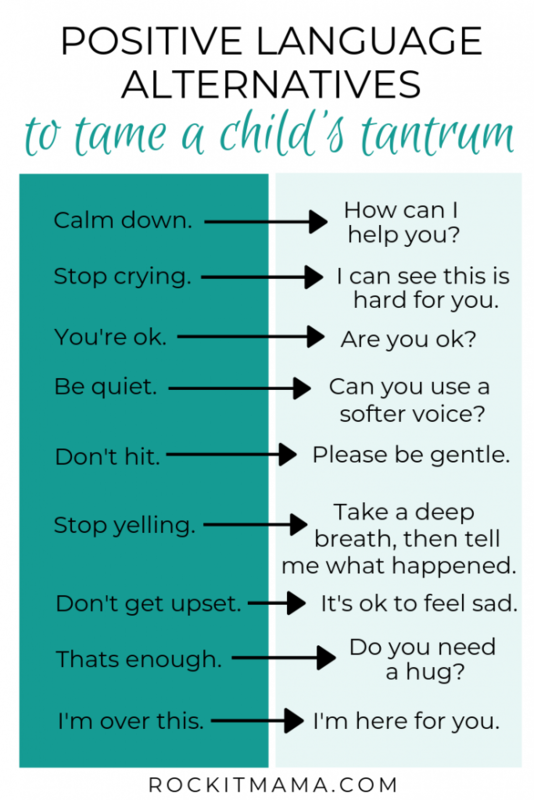 Try to remove all emotion and focus on yourself, especially the guilt or embarrassment which can heighten feelings of overwhelm (remember, every parent has been there!) Your child isn’t trying to give you a tough time, they’re having a tough time. Avoid the use of “no” if at all possible and try these positive language alternatives. Does your child have a favorite book or comforting blanket? Offering these items could help console a child during a tantrum. Other tools could be a calming jar (such as these), relaxation activities such as deep breaths or yoga poses, essential oils, and songs. When the meltdown occurs in a public place without access to these tools, try removing them from the environment in which the situation began. If your child runs, throws or hits during a meltdown assess surroundings to ensure safety before approaching. Hugging is an excellent use of diversion, but always ask if they need a hug beforehand. Studies have shown that proprioceptive input through hugging is extremely helpful for regulating the senses and helping tame a tantrum. Something as simple as a tight squeeze can provide a sense of calm & return your child to the moment. Will this decision impact my child down the road? Examples: Something like, wearing a helmet on the tricycle could potentially have long term effects and is probably a battle to be fought. Forcing a child to hug a relative before they leave (and thus inducing an incident) is likely not life altering. Maybe have a conversation later about hugging and why we show affection instead of ensnaring yourself in an emotionally escalated situation. A sure-fire way to keep the tantrums coming is to cave or give in to the tantrum. For example, if a child melts down in the candy aisle begging for a lollipop, giving her the lollipop will underline the negative behavior and reinforce it for next time. If the child is denied the lollipop repeatedly, it’s possible for them to learn that a tantrum in this particular instance will not get them what they want. Be consistent and confident with your choices as you know best for the child, not vice versa. Purchase now through February 28 for $115.00 and FREE Shipping! Call Peggy Glass at 401-488-3395 to order your kit today! For those of you in the Kansas-Nebraska Conference using the newly produced SDA program, Sea of Miracles VBX: Where kids get caught by Jesus' love!, you can borrow a large 10 x 20 backdrop with stand, 5 stand-up posters, and a 3x8 foot vertical banner with stand that go with the program for free! All you have to do is transport the items. It's on a first come first serve basis so just call the office and talk to Sue Carlson to reserve these great resources! These props can also be used with the Sea of Miracles VBX program as the basis for a Children's Church. Borrow free of charge on a first come first serve basis from the KS-NE Conference Children's Ministries Dept. 5. Die Cuts: Bring your paper, art foam, etc. to the KS-NE Conference and use the Sizzix Pro to cut out your Sabbath School / Children's Church, VBS, etc. projects! Lap Book: Children make in Sabbath School, Sabbath afternoon Kids' Club, Child Evangelistic Program craft, etc. 7. Local Church Happenings..."Cutting Edge Reports"